Opened CamCamX and dropped a music video onto Source A (could just as well have been a still image taken with a cellphone). Launched PhotoBooth and took a picture of the prerecorded video. As you can see from the screen grab, PhotoBooth believes the 12" MacBook has a built-in iSight, even though the Mac has no physical camera at all - that's how good our iSight emulation is. 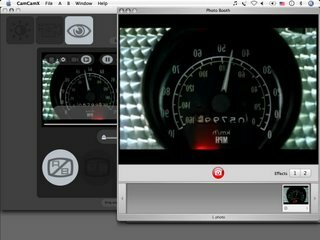 Having a fake webcam is useful for uploading pre-edited video content to sites that only accept webcam input. Also, webcam performers might like to stage additional performances by repeat broadcasting earlier performances or rebroadcasting performances for viewers in different timezones. It's a handy feature, and if you were using Windows instead of a Mac, you'd pay $20 for a very rudimentary application that can barely emulate a webcam, let alone a full video mixer with multiple camera inputs. If you need fake microphone to go with fake webcam, we suggest using SoundFlower and SoundFlowerBed.app. In our release notes for version 1.5 of CamCamX, we state that the Logitech QuickCam UltraVision is "just as good" as the external Apple iSight. I want to clarify what we mean by that right now. Apple no longer sells the external FireWire iSight. I'm sure there is some stock floating around on eBay and in other stores, and if possible, our recommendation at this time is that if you are wanting a second camera for doing 2-camera shoots with CamCamX, you should definitely pick up an Apple iSight (FireWire). First of all, it is much better to have your second camera on the FW bus instead of the USB bus (we're assuming a modern Intel MacBook here). While QuickTime can open a second camera on the USB bus, we're not exactly clear on whether the second camera is always opened in high-resolution mode, or if it is reduced to a 320x240 type frame size. We'll keep you updated on that fact. Prior to CamCamX 1.5, if you had a Logitech QuickCam UltraVision, the default processing path was conversion to RGB (the old standby) and then back to YUV for use in the video mixer. However, in version 1.5 we made specific changes to the product so that the UltraVision pixels would be just as good as the native pixels from an iSight. This is what we meant in the release notes, which were hastily written on the day of the product ship. As far as image quality goes, it appears to us that Apple is doing some image processing on the iSight frames at the driver level. In particular, we believe they are doing a temporal based noise reduction and possibly histogram equalization on the chroma channels to make the image more vivid. Which is why the iSight simply looks better than any other webcam on the market that we've tested, both Mac and PC. And as a side note, despite the much smaller size of the camera in the MacBook, these tiny built in cameras have significantly improved image quality over the older external FireWire iSight. In summary, when shopping for a second camera for live 2-camera webcasting, if at all possible, use a FireWire iSight, and if one of those is not available, the Logitech QuickCam UltraVision is the preferred second choice for use with CamCamX.